Silence a high-ranking priest who is spreading lies about the Dark Brotherhood. 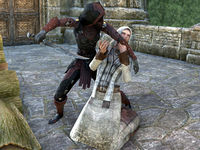 Recent lectures in Kvatch by the Grand Sermonizer of Akatosh and her priests paint the Dark Brotherhood as powerless pretenders not to be feared. Astara wants the Grand Sermonizer dealt with—permanently. Chase her down and kill her. Talk to Astara back at the Sanctuary. "Speak with me a moment, Initiate." "Astara sent word. There's a situation in Kvatch that requires immediate attention. Go to the Sanctuary and the Matron will tell you all about it." I'll go talk to Astara in the Sanctuary. "Once again, the pious idiots of Kvatch dare to provoke the anger of the Dark Brotherhood. Such an insult cannot be allowed to stand unchallenged!" What's going on in Kvatch? "As if the Grand Sermonizer didn't have enough vices to rage about, now she's preaching against the Brotherhood. She says we are weak, powerless. A toothless dragon that inspires ridicule instead of fear. These lies must be silenced—permanently." I can go to Kvatch. "Be wary. The Order of the Hour has increased its presence in Kvatch. Avoid the warrior-priests if you can. Meet up with Tanek and silence the priests that speak against us, including the Grand Sermonizer. That will put the fear of Sithis in them." "I was wondering how long it would take you to get here. Didn't Astara instill you with a sense of urgency about this mission? She must be getting tender-hearted after all these years." "Yes, I'd say so. I find life to be a complicated series of pranks and pratfalls. Besides, this is your mission. I'm only here to observe and offer assistance if you get in over your head. Speaking of which, try not to get captured or killed today." So you're just going to stand around and watch? "No, that would be boring. You start murdering the Sermonizer's priests while I take on the real challenge. I'll locate her hiding spot. Then I'll find you so we can kill her together. That will put the fear of the Brotherhood in the Kvatch people!" What happens if I get spotted making a kill? "Be stealthy or slaughter everyone that gets in your way. Whichever works best for you. They all wind up with Sithis in the end, so what's the worry? Now let's get out there and deal with the Grand Sermonizer and her lying priests." Sounds like we have a plan. Tanek's advice is actually very poor. 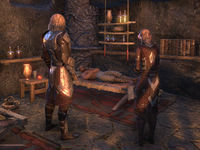 While there are a few members of the Order patrolling the city, and they can be killed if you attract their attention, the city is mostly still patrolled by the usual Kvatch Guards, who are virtually immortal. 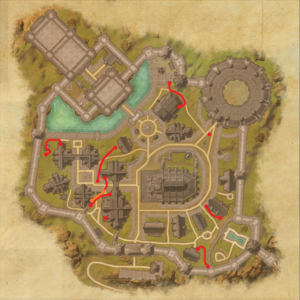 A partial map of Sermonizer positions and patrols in Kvatch. Not all Sermonizers have been mapped. You need to kill three Sermonizers. They won't be indicated on your map or compass, but you'll be able to see a Dark Brotherhood insignia above their heads as your approach them, and the insignia is visible through walls. Some Sermonizers patrol between street corners, where they give impassioned speeches denouncing the Dark Brotherhood, and more secluded areas, where they are vulnerable. 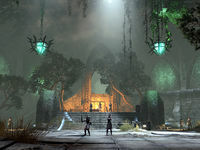 Even when they're giving speeches, there often aren't any guards around, so you can kill them without immediately putting your life on the line; however, civilians do sometimes gather around the Sermonizers during speeches, so they'll witness particularly public kills (causing you to incur a bounty that will last even after quest completion) and they may even attack you in retaliation for murdering a Sermonizer. Once you've met your quota, Tanek will approach you and inform you that he's located the Grand Sermonizer: she's holed in in an estate outside of Kvatch's walls. You can head directly to her, or kill two more Sermonizers first, as a bonus objective. Grand Sermonizer Fithia is at the At-Himah Family Estate. Once you enter, you are committed: logging out or otherwise leaving the Estate will reset the quest to this moment. When you enter, Tanek will order you to head through the upstairs door to the Observation Balcony. You're free to follow him immediately or search the surrounding area for loot first. Once you get to the Observation Balcony, you'll overhear a discussion between the Grand Sermonizer and a woman in black armor, who are standing over a dead body in an Interrogation Hall below you. There's no risk of being detected, so feel free to loot the downstairs rooms to either side of the Interrogation Hall. After the Grand Sermonizer's conversation finishes and she applies some magic to the nearby dead body, she'll step out, and Tanek will beckon you to follow him into the Interrogation Hall. There, Tanek will inspect the body -- that of Cimbar, a Dark Brotherhood member -- only to immediately fall prey to some sort of magical trap. The Grand Sermonizer and an Order Blade-Bearer will enter. Kill the Order member and knock the Grand Sermonizer to low health to force her to flee. (If you take long enough, the Grand Sermonizer will mention someone named "the Black Dragon." Keep that in mind for later.) At this point, Kor will barge into the room and order you to follow the Grand Sermonizer while he sees to Tanek. Go through the door to the Grand Sermonizer's Study. You may loot the room at your leisure before continuing through a trapdoor to the estate's Escape Tunnel. Several members of the Order stand between you and a large chamber, where the Grand Sermonizer waits for you. Kill them and get to the chamber. Here, the Grand Sermonizer will send three pairs of Order members at you, before finally fighting you with two more Order members -- one spellcaster and one swordsman -- at her side. The Grand Sermonizer is noticeably more difficult to fight here than back at the Interrogation Hall, and low-level characters may run into some trouble; make sure you have healing potions. If you die in battle after killing the first three pairs of Order members, the Grand Sermonizer's last two allies will respawn. "Kor brought Tanek home, injured but alive. He told me you went after the Grand Sermonizer. Tell me, has the deed been done?" The Grand Sermonizer and her priests are dead. We found Cimbar, tortured to death. "Cimbar was one of our best. To allow himself to be captured like that ... I didn't think that either the Grand Sermonizer or the Order of the Hour was capable of such a feat. Why go to all that trouble, I wonder?" A warrior in black armor captured Cimbar. Said she wanted to learn the location of our Sanctuary. "Black armor? I've heard rumors of such a warrior. But to seek the location of our Sanctuary? It appears we're at war with an unknown adversary. I need to think about this. By the way, Tanek woke up and asked to see you." I'll go talk to Tanek. "Kor and Hildegard mean well, but they're worse than a couple of mother hens. You're alive. Does that mean the Grand Sermonizer is no longer with us?" The Grand Sermonizer is dead. But how are you doing? "We're not certain what kind of magic the Grand Sermonizer placed upon Cimbar's body, but I'd be dead, too, if not for you and Kor. I'm indebted to you both." At least they didn't learn the location of the Sanctuary. "And I'll make sure that everyone remembers Cimbar's bravery. He refused to give up our secret, no matter what the Grand Sermonizer did to him. It does make me wonder about the warrior who was able to defeat him, though." You mean that black-armored warrior? "Cimbar could easily best me in a fight, and that warrior bested him. If you encounter her again, don't underestimate her skills and abilities. She's hunting the hunters, and that's a game I have no desire to play." Is there anything else you need right now? "A chance to beat your record. How many of the Sermonizer's priests did you murder anyway? Seriously, New-blade, stay sharp out there. The roots of our trouble stretch deep below the soil. Things are going to get worse, my friend. Mark my words." Astara and the Dark Brotherhood have need of me. I must travel to the Sanctuary and speak to Astara. Astara ordered me to go to Kvatch to meet up with Tanek. Then we can determine how to demonstrate the Dark Brotherhood's true power to the Grand Sermonizer and her followers. I reached Kvatch. Now I should talk to Tanek and determine how we're going to proceed. 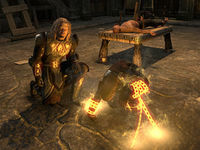 I need to kill Akatosh Sermonizers in the streets of Kvatch, being careful to avoid guards and witnesses. The death of her priests should draw out the Grand Sermonizer so that Tanek can find her hiding spot. Tanek discovered that the Grand Sermonizer has taken refuge in her family's estate outside the walls of Kvatch. I need to travel to her estate and find a way inside. We entered the estate where the Grand Sermonizer is hiding. I should look around and see if I can determine what's going on here. The Grand Sermonizer is alone in the interrogation hall. Now's our opportunity to complete our mission and assassinate her for speaking out against the Dark Brotherhood. The Grand Sermonizer vanished, but she left behind the assassin she tortured to death. I should stand aside and let Tanek investigate the scene. The Grand Sermonizer disappeared before I could finish her off, but Tanek still suffers under her spell. I should make sure he's all right before I chase after the Grand Sermonizer. Kor arrived to help Tanek. He ordered me to finish the mission and chase down the Grand Sermonizer. I need to follow her escape route before she gets away. I found the Grand Sermonizer's escape tunnel that runs beneath the estate. I should follow after her and try to catch her before she gets away. I caught up to the Grand Sermonizer and her cadre of Order of the Hour soldiers. Let the final battle begin! The Grand Sermonizer is dead. I should return to the Dark Brotherhood Sanctuary and report what happened to Astara. Astara needs to hear about what happened at the Grand Sermonizer's estate. I should tell her what happened to Brother Cimbar and about the warrior in black armor. Kor helped Tanek make it back to the Sanctuary, though Tanek was badly injured by the Grand Sermonizer's trap. Tanek has asked to see me. I should check on him. Tanek recovers under the watchful eyes of Kor and Hildegard. I should wait for them to finish their visit. Tanek sent Kor and Hildegard away and asked to speak to me privately. I should find out what he wants. Finishes quest Tanek will recover, given rest and time. I should see if there's anything else he needs before we consider the Grand Sermonizer situation dealt with.